Since Microsoft will no longer support their Windows Server 2003 the clock is ticking for many companies that need to upgrade their servers. Without upgrading, organizations that are still running the server will be subject to unsupported software, security risks, and compliance issues. 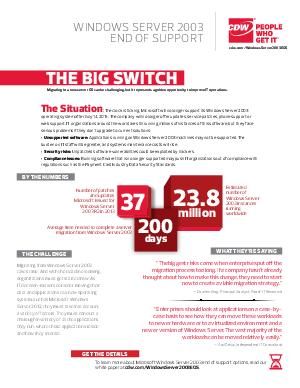 Download this whitepaper to learn the best practices for migrating to a new server operating system and see how the switch may be challenging, but will allow your organization to vastly improve IT operations.